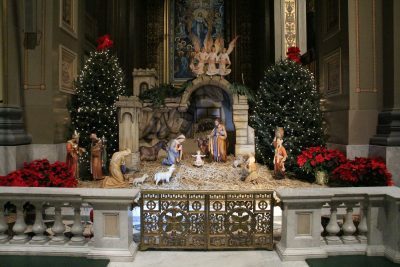 Three liturgical choirs will present the fourth annual “Sounds of the Season” Christmas concert on Sunday, Dec. 9 at 3 p.m. at the Cathedral Basilica of SS. Peter and Paul, Philadelphia. The Cathedral Choir, Archdiocesan Adult Choir and Archdiocesan Children’s Choir will perform works by several composers and include audience participation to sing well-known Christmas carols. Choir Director Charlene Angelini hopes to allow concert-goers of all denominations to listen, pray and experience community through music, and to have everyone leave the concert with a sense of joy and hope. Tickets for the concert will be available at the door, and complimentary parking is available in the cathedral parking lot. The Cathedral is located at 18th and the Benjamin Franklin Parkway, Philadelphia. Learn more about the concert on the website of the archdiocesan Office for Divine Worship.